American mothers have been caught in the grip of a frank and very public debate about how to balance their many needs and desires: How to pursue a dream career — or a necessary paycheck — while caring well for their children. How to pull back when necessary and lean in when it’s right (and how to know when it is right). How to be engaged but not crazed. And, at the heart of it all, it seems, how to be happy. While the debate about female identify has roiled on the front burner of the proverbial American family kitchen (you couldn’t have missed it in the national magazines, on the daily news and in social media), a quiet revolution has been simmering on the back burner. With equal passion but less angst, a new breed of dads is choosing not to sacrifice everything for high-powered, family-draining jobs. Instead, chasing the American dream has evolved for some fathers into busily balancing work lives with home lives (and often shutting everything else out as they constantly try to stay ahead of the ultimate nemesis: not “daddy wars” or unsympathetic workplace policies, but the lack of time itself). Instead of demanding the steak and potatoes of their fathers’ era, or lifting a symbolic but — let’s be honest — not very helpful few fingers like dads of the ’90s, many dads of now begin their days by loading up slow cookers, so dinner is ready when their families rush to reunite at the table. Instead of plopping down on the couch with the remote and a beer, these dads are tuning into their kids like never before. Instead of just taking direction from their partners, they are holding their portion of the domestic reins, refereeing between cookies and carrots, fashioning nearly-as-neat hair buns for ballet, skipping evening work events in order to preserve family time and putting the kids to bed while their spouses stay out for a networking happy hour. These modern dads are equally helping to chart the course of their kids’ lives. Some are primary caregivers. Others split the child-rearing duties as best they can, with work schedules, night classes and the occasional personal endeavor dictating who pitches in each morning, evening, sick day, teacher training day and field-trip day. Other dads, while holding the traditional breadwinner role in families in which both adults have agreed it’s best to have one at home, are still increasingly focused on being present and engaged every minute they can be. For those who might still fantasize about the seeming simplicity of our fathers’ eras (some were straight out of the ’50s Madmen; other fathers came to paternity during the ’70s, when mothers were forging a new feminist path, yet were still left holding the diapers), society is dragging them off the sofa whether they want it or not. And while the modern juggle might be less likely to induce angst or identity crises for us than for our wives (and while, on the whole, we don’t judge each other harshly like moms do), it’s still really hard work. On some fronts, we don’t do well enough. On an average day in households with children younger than age 6, women spent 1.1 hours providing physical care to children (such as bathing or feeding a child) compared to 26 minutes for men, according to U.S. Bureau of Labor Statistics data for 2007–2011. A woman still earns 77 cents to the man’s $1. Most of us are not blind to modern motherhood’s struggles. We want our partners to earn as much as we do, and to feel sane and worthy and fulfilled. We are just as eager for family-friendly workplace policies (I’m talking to you, Marissa Mayer), so that we can work from home sometimes and tend to our newborns, too. As men (those of us who need family-friendly workplace policies as well as those in upper management who have the power to enact them), we need to do a better job of pushing for those changes. At least that’s the case for the six fathers I talked to about chasing a modern-dad dream in a world often overshadowed by moms’ pressure to do it all. 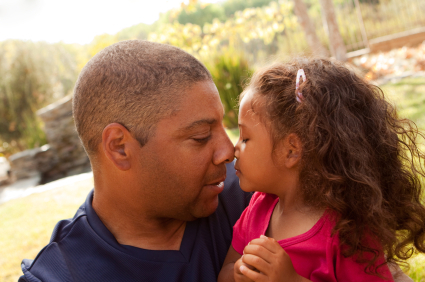 With Father’s Day just around the corner (and at the urging of my wife, ParentMap Web editor Natalie Singer-Velush), I decided to publicly pry open the mind of today’s father. Dads don’t usually talk about this stuff, but with some prodding and an offer of free beer, I loosened their tongues. Here are their stories of modern fatherhood. 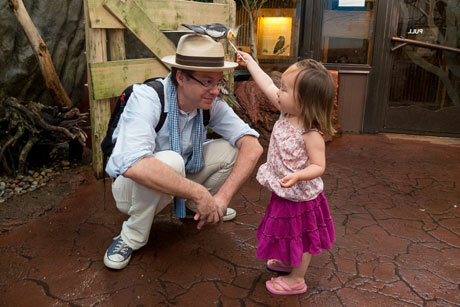 Seattle dad Stuart Isett with his daughter at the zoo. Photo by Stuart Isett, www.isett.com. While his wife, Jennifer, held a steady job for 10 years, Stuart Isett taught himself to be a world-class photographer. Then, they decided to have kids. Thanks to his wife’s continued employment through two babies, Isett now has pedigree that enables him to work part-time and get paid well. A Seattle-based photographer who freelances for The New York Times, among other companies, Isett knows he has something special. He works at his passion part-time, and he gets to be the main caregiver to his two daughters (and the primary housekeeper). For him, that is everything. Isett wants to be Mr. Mom (that includes scheduling kid events, prepping dinner, bandaging up ouchies and scrubbing toilets). Most photographers he knows are on the road, courting international excitement and the picture that could make them a superstar. “I’d rather be at home with my wife and my kids,” he confesses. As with many modern parent couples, the Isetts’ reality — which allows for a comfortable home near a good public school, well-tended kids and Friday-night dinner out with their grade-schooler and preschooler — is the result of compromise, personal and professional sacrifice and a finely tuned degree of manageable guilt. Isett says if he chose 20 photographers he knows well, he would say most of them have paid a steep price for obsessively chasing their dreams. For many fathers, modern balance is the result of calculated limits. John Cirone can put particular perspective on dads doing their fair share: He’s from a two-dad household. One year ago, Cirone and his partner, David Brannon, who have two children, ages 11 and 9, realized they were spending too much time working and outsourcing their lives, and not enough time with their kids and each other. So Brannon quit his job and became the primary caregiver and president of their school’s PTA. Cirone kept his job at Microsoft, they sold their house and moved into a more affordable home, and they began living off of just Cirone’s salary. Cirone remains focused on limiting work hours so that he can be present (no e-mail during kid time). 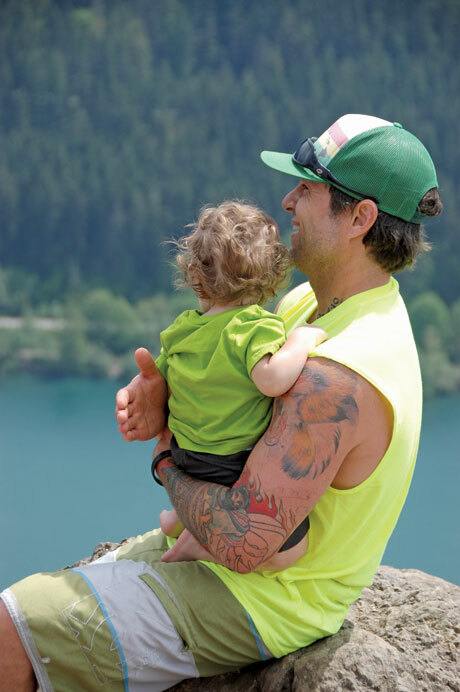 Who does what in his household is in a “constant state of evolution,” says Clayton Beaudoin, a Seattle dad of a preschooler and a second-grader, who works 40–50 hours per week while his wife, Sharon, works 35–40. Mornings, drop-offs, practices — it all has to be organized constantly as schedules change and “stuff” always pops up. Like most parents, he’d like more time back. Both of his kids spend time in before- and after-school programs on most days. Having it all for him means being fulfilled at work, at home and having a little time left for himself. Still, just like many angst-ridden mothers, Beaudoin isn’t always sure he’s doing exactly the right thing. He admits he could and should do more at home. “I could be better at taking things off of [Sharon],” he says. For some modern dads, having it all means helping their wives chase it all. Hugh Ewart, a father of two girls ages 7 and 5, has tried to be a steadying force as his wife pursues her dream of going back to school and reinventing herself. “For a number of years we both had family-wage jobs that put us in a really good position,” says Ewart, who does government relations at an area hospital. When his wife, Sarah, left her job and enrolled in a master’s program, things changed. The family cut back drastically, paused putting money in their girls’ college funds, and slimmed down everywhere. Some afternoons, Ewart is on dad duty, taking advantage of the flexible work schedule his employer supports. Other days, when she’s not at school, Sarah keeps things moving at home. There’s risk involved — “she’s going after a dream and it’s not entirely clear what it looks like yet,” Ewart says — but the risk seems worth it. Increasingly, modern parents are rejecting the term “having it all” (a phrase that brings with it its own baggage) entirely. For them, the challenge is spending enough time with Reese, 8, who is in after-school care four days per week. But Visaya and Jones feel differently about the limited time they do have with Reese, perhaps highlighting one touchy reason why the conversation about working mothers in America has been so different than the conversation about working fathers. Because of her tendency to worry more, Jones ends up doing more of the traditional parenting, Visaya says. “I feel like there are weird social pressures on how we’re expected to sit around and watch football. After many rounds of beer, the last dad in my group of friends spoke. Unlike the rest of us, his Dad 2.0 experience is somewhat traditional. Darrell Hart is the sole breadwinner by choice; his wife, Belen, is a stay-at-home mom to their two school-age children. “After hearing everyone else, I have to say that we are so lucky. Belen takes care of everything — I appreciate it, but I don’t know if I appreciate it enough,” Hart says. His wife, who left her job when her employer Washington Mutual went out of business, does sometimes wonder if she would be happier working. “I think she has that turmoil,” says Hart. No one at the table had to ask Hart which turmoil he spoke of. We all knew. We’ve watched our own wives, some who work, some who have stayed at home, go through it, too. In my family, we’ve done it all: We’ve struggled to make ends meet with two time-consuming jobs; once we could afford it, my wife took time off to stay at home, which she loved at first and then grew tired of. Now we both work full-time at jobs that offer some flexibility, but demand a lot of us. Almost every spare minute we have goes to each other and to our two daughters, ages 6 and 7. We find our role models where we can, and we set our parenting bar high. As a dad, I’m not done. The tough and awesome years of parenting are still ahead of me. I’m out there taking swings, sometimes missing, trying to keep it together, always working on it. Lukas Velush became a dad when his daughter Lola was born in 2005, and again when Tansy, his second daughter, was born in 2007. He has worked as an editor at Microsoft for five years, and before that worked as a newspaper reporter for 14 years. He cycles, gardens, and plays basketball in his spare time. Lukas Velush became a dad when his first daughter was born in 2005, and again when his second daughter was born in 2007. 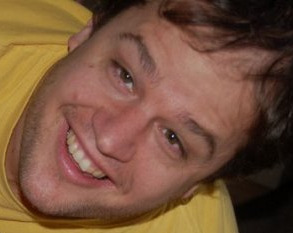 He has worked as a journalist at newspapers around the West and an editor at Microsoft. He cycles, gardens, and plays basketball in his spare time.